On Saturday night (March 2nd) Sydney celebrated 35 years of holding their annual Mardi Gras festival with a parade celebrating Lesbian, Gay, Bisexual, Transgender, Queer and Intersex pride. Over 10,000 people performed in the parade with thousands of on lookers enjoying two hours of fun and frolics along the main gay hub of Oxford Street. RUComingOut's Clare was there . 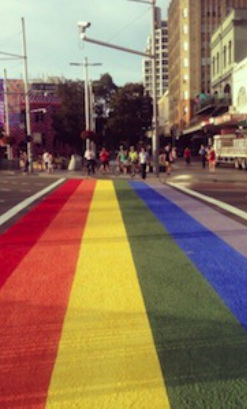 . .
Sydney's Mardi Gras Festival is held annually at the end of the summer season in February. This year's event ran from Feb 8th to March 3rd. During this time a series of events showcasing talents and highlighting issues within the LGBTQI community are held in and around the city. This year, an adaptation of Jonathan Harvey's 'Beautiful Thing' was performed in the Seymour Centre and Heather Peace headlined the Fair Day during the early stages of the festival. The Mardi Gras Parade and the subsequent after parties celebrate the culmination of a whole month of Pride. "Organisers have said that it was the biggest Mardi Gras to date." Unlike previous years, there was no major international superstar present. No Kylie, no Madonna, no Ricky Martin, but there was no sense of that being a letdown. The appearance of DJ Crystal (Jake Shears), Heather Small, Delta Goodrum and Australian favourites The Presets were enough to satisfy those craving a celebrity appearance. For me, the lack of major celebrity (with exception of Jake Shears of course) made the night even more special. Thousands of people from all over the world were not there to see Ricky Martin's bang, but turned out in force to celebrate every (not so) average Joe from the LGBTQI community. And it was the whole community we were celebrating. It seemed every corner of society was represented. The 'Dykes on Bikes' held tradition and kicked off proceedings. Then we cheered and celebrated a 'Happy Mardi Gras'. We saw representatives from the RAF, Navy, Army and the police. There were teachers, doctors, lawyers and lifeguards. People from sporting groups and all political parties. There were Christians, Jews, atheists, schools, banks, internet companies, drag queens, transsexuals, fetishists and everybody else in between. In place of the major celeb, the Mardi Gras bus gave pride of place to some members of the original 1978 pioneering organisers and attendees. Lest we forget their courage of being open in a world where to be homosexual was illegal. The theme for this year's event was 'generations of love' and these people are the brave souls whose actions have enabled our progression. I arrived in Sydney a few days before the Mardi Gras parade. It quickly struck me how the whole city embraces the festival, with rainbow flags draping from the Town Hall to rainbow banners in Starbucks and many retail outlets in the Central Business District. Whilst having lunch one day I overheard a couple of businessmen talking about their plans for the parade and how excited they were. Mardi Gras is not important just for the LGBTQI community, it is important to all Sydney as a whole. And being able to share this special event filled me with a warm pride that I have very rarely felt. "I have never felt as gay or as proud as I did last Saturday night." It also made me a little bit sad to remember the issues surrounding World Pride 2012 when the Mayor of London tried his best to hamper the event. The Sydney Mardi Gras Parade had over 100 floats parading down one of the major streets in Sydney, shutting off traffic and redirecting public transport for nearly 24 hours. London didn't have a single float. They didn't even close any streets. I have grown a great respect for the city of Sydney as the council seem to be more concerned with humanity than money. London take note!